Muay Thai Warriors returns on Sunday the 4th of November. Muay Thai Warriors will be continuing the theme of Nation versus Nation in this next event albeit at a much closer locale in Cambodia or modern day Khmer. The last event was in China with a China versus Thailand theme. Notably, Saenchai PKSaenchaiMuaythai gym was matched against Chao Li Dao (China) for the Muaythai Warriors Super-lightweight belt. Saenchai won by elbow knock out in one round against his Chinese opponent. 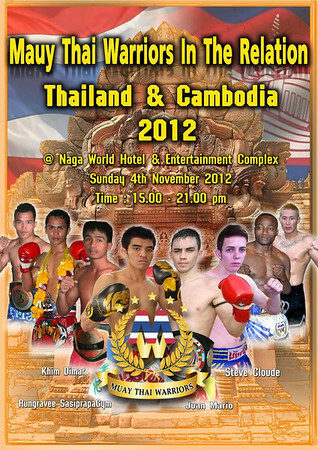 This time around Muay Thai Warriors will be bringing a Thailand versus Cambodia event on November 4th, 2012. 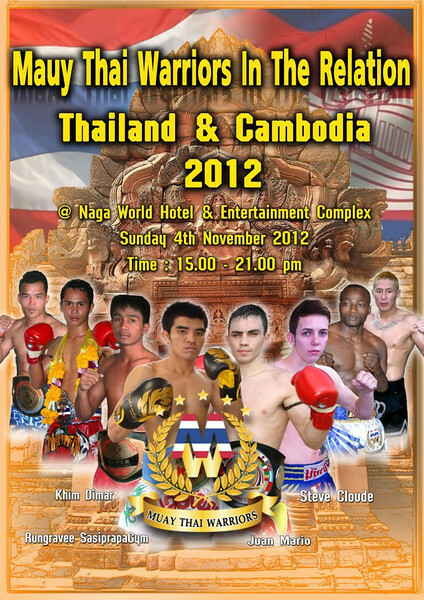 The fights will be from Phnom Penh, Cambodia but will also be broadcast on Thai television channel 11 9:00pm Thai time. Muay Thai Warriors makes one wonder if this is becoming a growing trend of international Muay Thai happening more with Thai promoters willingly becoming the away team. If it is the trend, I like it. By all appearances Muay Thai Warriors are well organized, well sponsored and making a logical leap, hopefully well funded. Just in case you missed the Saenchai vs. Chao Li Dao fight, here’s the clip of the fight. ~ by fatsoking on October 21, 2012.